This ice-cream is dedicated to all but specially to those who love strawberries. I love strawberries. I like khatta-meetha taste in this fruit and this ice-cream refreshing my childhood memories. When I was kid, I eat this ice-cream,that time it was cost around 2 Rs and sometimes we put this ice-cream in a cone also sprinkle lots of with tutti-frutti jellies [awesome childhood memories - Things change, people change but memories never change]. 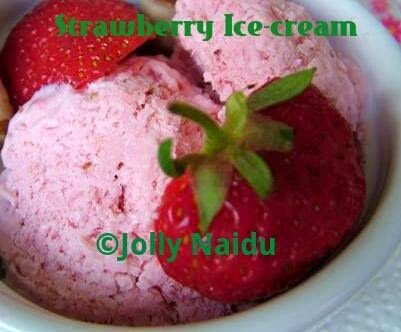 Strawberry ice-cream is made up with strawberries, cream, milk, sugar and other ingredients. It's a very simple to make at home. This is delicious too !! Strawberry ice cream recipe with step by step process. Learn to make quick and easy strawberry ice cream recipe at home. You can increase your ingredients as per as your requirement of ice-cream. 1. Boil the milk and reduce its quantity upto half. 2. Add sugar, corn flour (mixed in a little water so that it does form lumps) to the milk. 3. Add the cream to the milk and stir well. Boil, until the mixture is thick. 4. Remove from fir and allow it too cool. 5. Wash the strawberries and make a pulp. Add this pulp, raisins, almonds and the cashew nuts to thickened mixture of milk. 6. When the ice cream is almost set, break into parts with a knife and add in the blender jar. You can see the ice crystals in ice-cream and we need to get rid of these. 7. Blend till the whole mixture is smooth and slightly doubled up. Pour back in the same container and keep in the freezer for the ice cream to set for 8-9 hrs (overnight). 8. Serve chilled and Garnish with strawberries. You can do lots of creativity with this, make a thick any fruit shake and put 1 or 2 scoop of ice-cream onto it and sprinkle chopped nuts. While serving ice-cream, you can pour chocolate syrup on top and add wafer with it.